While I wouldn’t want to condone the veneration of saints, I’m all for learning lessons from those who have gone before us. And, seeing as it’s St David’s Day today, I thought we could learn a lesson from Dewi (that was his proper name). Now, first of all let me say this, most of what we know about Dewi’s life was written down about four or five hundred years after his death, so no doubt some of the details have been embellished or misremembered with time. As well as that, when ‘Lives’ were written of saints back in those days, the intent was not to give us what we’d understand as a biography today. Rather, hagiographies were usually written to give a reverential account of a saint’s miracles and deeds. And often there were other reasons behind their writing as well (in the case of Dewi, his Vita was written in part to enhance the claims of the bishops of Saint David’s to metropolitan status and equality with Canterbury). Added to that warning about the little we know about Dewi, there are also some things we do know about him on which we might not be so keen. Dewi was an ascetic. His monks lived on bread and water and had no personal possessions. They even had to pull the plough themselves, without any animals for assistance! However, there is something wonderful that we do know about Dewi. We know why he became (arch-)bishop of St David’s (or Menevia, as obviously it wasn’t yet called St David’s when he became the bishop!). Dewi, who at the time was of relatively minor significance, was, rather unusually for someone so unimportant, allowed to speak at the Synod of Brefi. And, as a result, Dubricius (who was then the bishop) retired on the spot in favour of Dewi! Why on earth would Dubricius do that? Had Dewi exposed some wrong doing on Dubricius’ part? Not at all. Dubricius was a great evangelist (and like Dewi was later considered a saint – St Dyfrig). No, Dubricius made way for Dewi for an altogether different reason: because of his defence of the gospel. 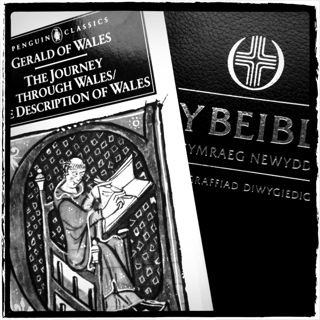 Dewi stood at Brefi to defend the gospel of God’s grace against Pelagianism. Pelagius had taught that man had the ability to keep the law of God and earn salvation and that Christ’s role was just to reveal what God requires of us. So, Pelagianism denied the free grace of God shown to us through Christ crucified and made salvation all about what we do instead of all about what Christ has done. Like Augustine before him, Dewi stood strongly against the Pelagian heresy. And through his defence of the grace of God at Brefi, Dewi became an archbishop (or bishop). Then a few years later he settled the matter once and for all in the British church at the Synod of Victory. In fact, perhaps it isn’t from Dewi at all that we can learn our lesson, but from Dubricius. Dubricius resigned his see in favour of Dewi, because Dubricius saw in Dewi’s preaching of the grace of God the mark of true Christian leadership. For true leadership in Christ’s Church isn’t about the ability to convene a smooth-running synod, give strategic advice or even cast new vision. Dubricius saw that Dewi cast the one true vision that the church needs to hear again and again – the grace of God in Christ. That’s the true role of Christian leadership – guarding the centrality of the gospel. And true Christian leaders, like Dewi, will stand strongly against those who would trade it for anything else.